I am following the voices of the majority so here it is! Part 2 of Did We Pay The Tour Company? Fast forward to my 9th day in China. We were back in Guilin. After the not so good experience at Backstreet Youth Hostel, I was glad that we checked into another hostel in Guilin. It's called Guilin Oasis Inn. This would be the last place we stay in China, as we would be returning to Malaysia the following day. At only 135 yuan (RM68) per night for a three-bed room, I thought it was worth our money! This did not look like a hostel but more like a real hotel! The service was good and the place was reasonably clean. I was going to have a good sleep that night! Or so I thought. After having our dinner and walking along the pedestrian streets, visiting the night markets, we decided to call it a day and return to Oasis Inn. As soon as we entered the lobby, the lady at the counter received a phone call asking for Jam. That caught us by surprise. Who would want to contact Jam in China? Nobody knew where we were staying! As soon as Jam answered the call, I could see the expression on his face changed. He did not say much and then he put down the phone. I was like, what the ....? The lady at the counter looked at us suspiciously as we hurried into our room. It was them! Jam told us it was the tour agent calling! My worst nightmare had come true! How the hell did they find out where we were staying? And Jam had hanged up just like that. Great! What would the caller on the other side think? They would surely be on their way to Oasis Inn, we had no doubt about that! Maybe we should move out of the hostel? Run away like fugitives? That's out of the question! I do not want to end up in jail! Especially Chinese jail! And guess what's worse. They could be bringing some gangsters to rough us out! Who knows what the Chinese people are capable of? Frankly, the thought of this made me a little panicky. But luckily, we managed to calm ourselves and think rationally. First things first. Did we try to avoid paying them? No, we didn't. Did we try to run away? Not really. In actual fact, we were waiting for them to collect the payment from us, and it was not our fault if they did not do so. So why were we so afraid? Maybe because Jam had hanged up on them. That's why! Jam, I am not blaming you for this. I would most probably do the same thing too if I were in your shoes. It was just too unexpected. Who would have thought that they would chase after us after so many days passed by without any news from them? I told Jam maybe he should call them and explain the matter. Just then, there was a knock on our door. We stood there, too stunned to move. Oh my God! They are here already!! How did they arrive so fast? To my relief, it turned out to be the hostel staff. Phew!! It was a call for Jam. Must be them again! Jam went to answer the call and came back telling us that they would be coming to collect the payment. I think the owner of the hostel was a little worried and asked us what was the problem. We said no problem! And went back into our room. We decided that we would meet them at the hostel lobby as it was not safe to meet them in our room. They could do anything to us inside the room! So we told the hostel staff to inform us once they arrive. Meantime, we planned our strategy. Well, we were about to go to war! 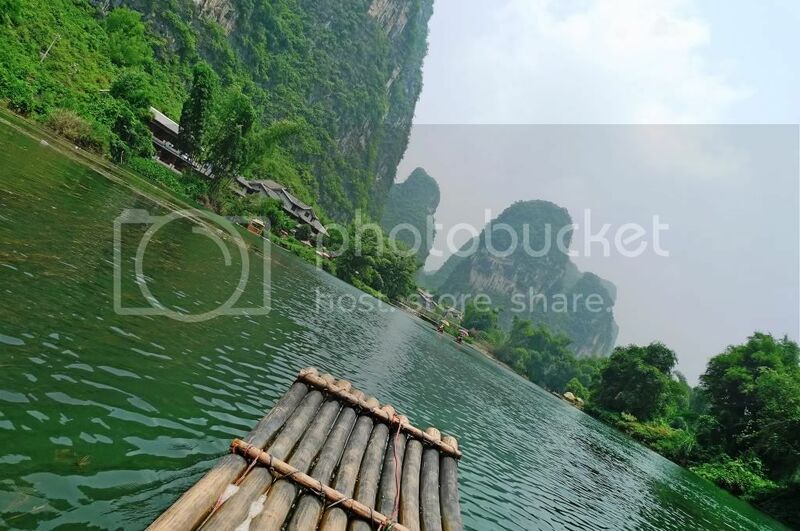 We decided that we would not pay for the whole package that include the Li River Cruise, tour guide to Yangshuo's 5 tourist attractions and The "Impression Liu San Jie" show. That's because we went to the "Impression Liu San Jie" show by ourselves. So we would only agree to pay for the Li River Cruise and tour guide in Yangshuo. That would cost us 330 yuan (RM165) per person. Nothing more, and to be fair, nothing less. Even then, Jam and his friend did not have enough money. They had splurged way too much thinking that the tour company would not be after us! Fortunately, I had excess money with me, so I lent it to them. Our main strategy of course, would be to make a big fuss over their poor service and question them over their inefficiency at collecting payment from us. Haha! We would act as if we were angry! They want to be angry with us? Let us show them that WE were the ones who were pissed off! Not them. Despite this, I could not help feeling a bit jittery. Waiting for them to arrive must have felt like one of the longest nights in my whole China trip. As it turned out, we had nothing much to worry about. A lady from the tour company came to meet us at the lobby. There were no men, no gangsters. Well, maybe the gangsters were outside, ready to move in if we fail to make the payment. Who knows? I could see the hostel owner was as worried as us. Poor fellow! We talked to the lady and complained all we could. Well, it's part of our strategy and it worked. She agreed that we pay for the whole package except the "Impression Liu San Jie" show. So we paid up. Before she left, we asked her how she managed to track us down. According to her, it was her duty to track us down. If she fail to do so, she would have to pay the company for the losses! So she went all out and contacted all the backpacker hostels in Guilin in search for us! I could not help thinking what a coincidence it must be for us to be at the Oasis Inn's lobby when she first made the call. The phone actually rang the moment we walked in. If we had entered the lobby just a few seconds later, she would have missed us. And we would have gotten away with it! I have never really believed in coincidences. There are no coincidences, as they say. I can only say this is karma at work. How else can you explain it? It never once crossed my mind that a trip to China would reinforce my belief in karma. Anyway, it was a hell of an experience! And I'm pretty sure that this experience would remain in my memory for a long, long time. Don't underestimate these Chinese tour companies man. They sure can track people down even if you try to hide. Honestly though, if you guys weren't planning on forgoing the payment due to the tour company, why panick? Even if you guys entered the lobby a few seconds later, she would still be able to locate you guys because you have your names registered in Oasis Inn ma. I've seen karma at work too. The connection of the the tour guide is very very good in China. Got to really be careful. They will get a little potion of what you have spent during the tour. You can run, but you can't hide. Spooky huh? That looks like a great room at a great price. This three-bed room concept sure comes in handy - for threesomes. I'm sure you are relieved that this episode is behind you now. Btw, how much was the discount in the end? wah... your room is so huge!!! gor 3 beds some more.. When I read your posts, I recalled my ex-boss. He told us his story in the office. When he was young, he had a meal with his friends in a stall. After the meal, they ran away without paying. He boasted to us his 'exciting' experience, but I was cursing him, "Shameful!" Well, I am happy that I don't have to curse you. Moment of Truth ~ can imagine you loading up your caliber.45, Jam and friend with the samurai sword walking down the hostel in slow motion ready to..[cut]haha too much movies..I presume that moment was your very worst in your entire life. HAHAAHHAHAHAHAHAAHHAHAHHAHAHAHAHAHAHAHAHAAHA............told ya.....nothing is mei you in china!!!!! see how fast they track u down oredi.....scary leh?! HAAHAHAHAHAHHAAHHAHAAHHAHHAHAAH.....i am sure you are still wondering how they managed to track down you all right?! WTF!!! hahhahahhahahahah.....like i said before,China got amazing landscape and the people, unbelievable. exclamation point. lol scary lah.. you made me think that there are gangster looking for you.. hmm. maybe the lady is gangster herself.. pretending to be good first, if you dont pay at all.. she'll bash up you guys.. haha..
have to pity the lady oso lah... imagine having your pay deducted. That's why she had to track you down. Wow, I admire her resourcefulness. 80% of the worries in life are unfounded. Glad it ended up nicely, no gangsters whatsoever. Well, guess there's no such things as a free tour! I guess they are the better Big-Ear-Holes? :P Hahahha! I would of made more fuss! Then maybe can get discount hahaha :P. But oh well, aren't you glad you paid them off... it is our own concious that we have to live with :P.
RM68 for 3 days? Wow! It looks superb! :)Perhaps this is like a 5 star hostel? Make a little correction here. They did not call twice. The purpose I went out to the lobby was to ask the lady at the counter not to let the tour agent enter our room. Luckily, everything turns out well in the end! Wow! They were pretty persistent huh! So you guys had to pay RM165 to the travel company lar? Thank goodness you had extra cash back then huh. So in conclusion after all the suspense and long wait for 'years' our 2 "Malaysian Road Runners" - thought they "escaped" - beep, beep but somehow lost to "Speedy 'China' Gonzales" - ariba ariba gěiqián gěiqián [give money]. well, there's no such thing as a free lunch. better don't play play with these china men. i'm sure they can track u down no matter where u hide. LOL funny la u panicky dat time tot she bringing gangsters all hahahah! Sounds like if you guys don't pay, that lady would get fired or something huh? mei teng, why panic? I guess we do have the intention to escape payment at the back of our minds. Hehe. We didn't get any discounts! Just that we did not have to pay for the Liu San Jie show because we bought the tickets to the show ourselves and not through the tour company. cheahs@n, oh no that was not the worst moment in my life! I have encountered far worse situations. Haha! You have a good imagination. LOL! manglish, actually I thought they were rather slow in tracking us down. They should have located us earlier. What if we have already left China? kenwooi, haha who knows she may have kung fu skills? Haha! I see. You haven't covered Liu San Jie, have you? Oh, I forgot there are still the in-between days to cover, hor? Looking forward to them. Foong, I just discovered thru one of your ads that AirAsia has a new West Street hotel in Guilin. At least a hotel we're familiar with (the brand). All these guys in the tour business are connected to the hotel, vendors, shops, and many more. It is easy for them to find someone. The street vendors in Vietnam even know which was our hotel and where we were going to visit next.....they are connected! Wow! I cannot believe that she went through all those.. But well, it is a lot of money.. Lucky for you nothing happened. So at least now you have a clear conscience and no bad karma! wah... manglish laugh till so happy.. =.="
The poor girl would have to compensate her company if you all run and don't pay up. tekkaus, RM68 is for one night only, not 3 nights! life ramblings, there are free lunches in this world if you know where to look. Haha! Actually, I think they were still inefficient in tracking us down. They could have gotten to us sooner. What if we left China one day earlier? monica, yeah, they managed to track us down. But it's a good thing cos I don't want to owe people money! ai shiang, I guess she would have to pay the company if she could not find us! Oh, AirAsia has its own hotel in Guilin? What? It's called West Street Hotel? Well, AirAsia is smart to do that, because their potential customers are huge! Guilin is a very famous tourist area and is in big demand from travelers all over the world. pete, if they were that connected, I am surprised they could not track us down sooner. In fact, I thought they were pretty slow in finding us. We could have left China earlier! dolly, yalah don't know what's wrong with him! Haha! I guess everything worked out for the best for everybody. Even if their service was that poor or didn't meet your expectations you still were able to use their facilities and services. Good enough that she haggled with your demands. Poor girl too if she didn't get to have you guys pay... she'll have to pay for all the dues.